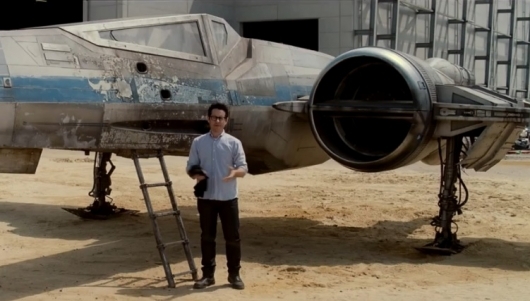 Back in May, a video was released from the set of Star Wars: Episode VII featuring director J.J. Abrams talking about a chance to appear in the movie by donating to an initiative through UNICEF that aims to help thousands of kids and families around the world called Star Wars: Force for Change. Now, with only a few days left, another video with Abrams has been released to announce that if you take part in the initiative this final week not only will you have a chance to win a role in the movie, but also a chance to win an advanced hometown screening of Episode VII for you and 20 of your friends and family. And just as the first video subtly revealed that practical makeup and effects would be a part of the new movie in the appearance of an alien, this new video unveils a full-size X-wing starfighter.